If Samsung and Apple are the ‘players’, let’s meet the coach – Google. It’s no surprise, Google made an elegant entry with Google Pixel (name not confirmed) in the smartphone market last year. Google Pixel 2 (name not confirmed) is its successor. Though there is no official announcement as of now, but it is expected to launch in October 2017. So whatever information you read here, is part rumor and part fact! News is, Google was planning to introduce three devices classified as Pixel 2, Muskie (Pixel 2 – XL) and Taimen (bigger than XL). Yes, you heard it right, even bigger than the XL. However, there’s been another update stating only the Pixel 2 and Taimen are going to be launched. While the size of the phone is directly proportional to the size of your pocket, there are other reasons to not miss on Pixel 2. One of the major reasons is its camera, which can’t be overlooked or ignored. Pixel 2 is expected to arrive with 12 MP front and 7 MP rear cameras with an articulate picture quality. Without diving deep, note that both Pixel 2 and XL may have different cameras mounted. Google may finally embrace the curved screen with the launch of Pixel 2. As the rumors rolled out, Google has placed the order with LG to develop curved screens for Pixel 2 and variants. 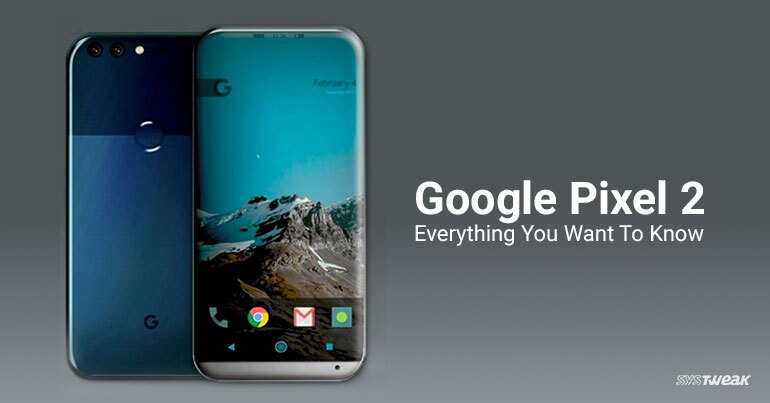 It might also be possible that LG would design one of the Pixel 2. It is believed that Google Pixel 2 screen is going to be 5.6 inches with 18:9 display and a 2,560 x 1,312 resolution. Unfortunately, there hasn’t been any update or rumor for Pixel 2 battery but it’s predicted to be at least 2800 mAh for Pixel 2 and 3500 mAh for XL. According to a recent claim, Pixel 2 is going to be the first ever phone to have used the Snapdragon 836 chipset processor, which is going to accelerate the 835-chipset performance by 10% along with battery life. Moreover, Pixel 2 is going to be a great configuration as it is supposed to have 4GB of RAM with 128GB of internal storage. This piece of phone is able to do almost everything without needing the outer support. There’s no definition of being special, especially when it comes to smartphones. But, Google had thought about it and if we go by the rumors, the Pixel 2 is going to have a squeezable frame, like the HTC U11. It makes the frame pressure-sensitive, and speculation is that squeezing the phone could lead to launch the Google Assistant. Overall, Google had planned to come up with something that can put everything aside; and Pixel 2 seems to make the plan successful. The price of the Google Pixel 2 is still a mystery, but it is not going to end any less than $650. Although, everything isn’t going to be a piece of cake as we’re expecting Note 8 and iPhone 8 to be launched too. For now, let’s wait and witness the exciting rivalry among the giants of the world.